Pan seared scallops with sauté kale and orzo pasta with wine & lemon sauce; Farfalle pasta with sauté asparagus, peas and red bell pepper with white wine & cream sauce; and grilled pork chop with balsamic reduction sauce and golden raisins served with mashed potatoes & roasted vegetables. 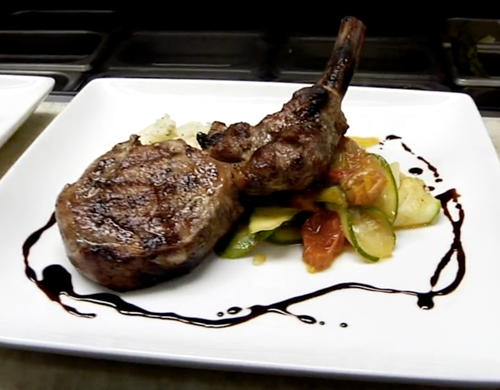 Prepared by Julian Viso, Executive Chef & Owner of Mio Italian Trattoria. 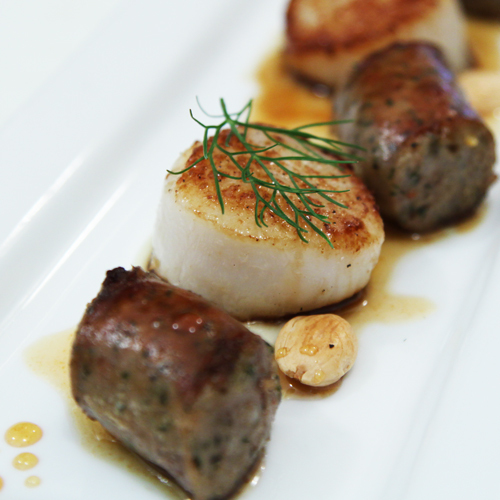 Prepared by Marc McCann, Executive Chef of Cafe Tempo and Marcel des Marteau, Executive Sous Chef of Cafe Tempo. 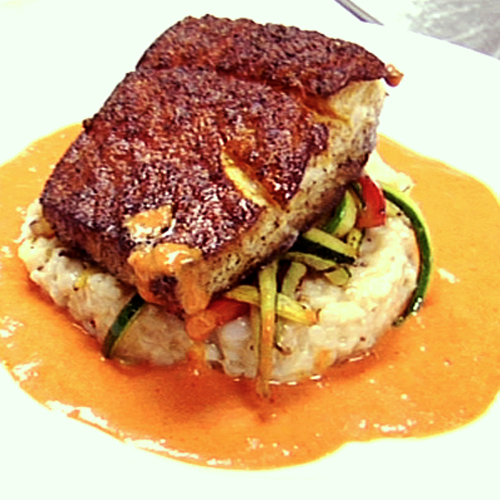 Prepared by Aaron Sanchez, Executive Chef of Mestizo. Mexican favorites prepared by one of Kansas City's finest chefs. 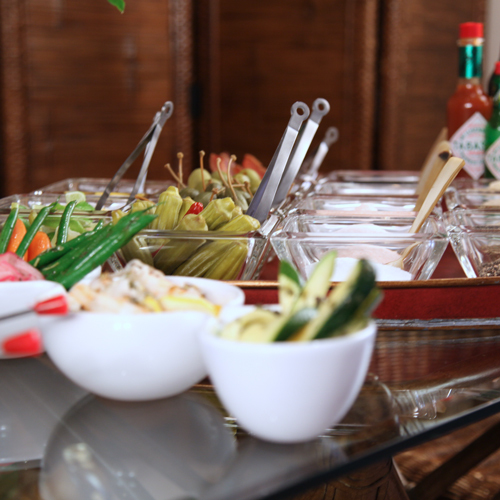 Prepared by Jonathan Justus, Executive Chef & Owner of Justus Drugstore Restaurant at John Wornall House. A collection of traditional favorited prepared using open hearth old-fashioned techniques. 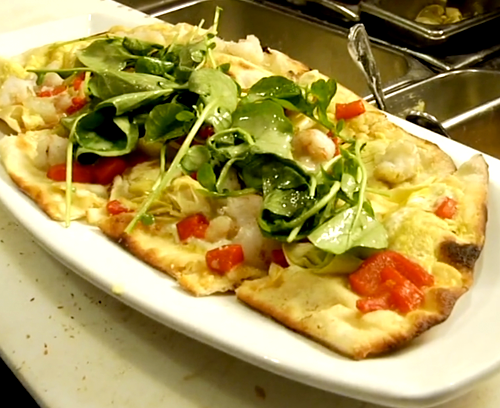 Prepared by Executive Chef Dan Swinney of Lidia’s A Tuscany home favorite, this delectable Italian dish makes use of local Kansas City produce and luxurious Maine lobster. Prepared by Debbie Gold, Executive Chef of The Red Door Grill. 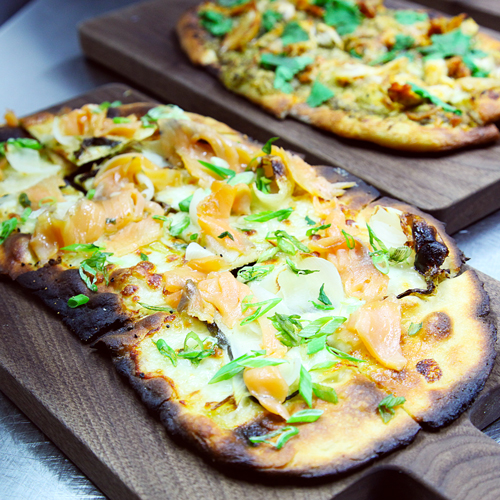 Specialty flatbreads are both uniquely creative and comfortingly delicious. Executive Chef Robert Padilla, Trezo Mare. The last of the season's asparagus, heirloom tomatoes and fresh peaches accompany the perfect pork chop. Prepared by Chef Bear Cohene at Westlake Ace Hardware. The fiery hot days of summer are the perfect time to take cooking outside and onto the grill. Learn how to take advantage of this cooking method for more than just the traditional hot dogs and hamburgers. Prepared by Stewart Lane, Executive Chef ofInspired Occasions. Research and Development Chef, Stewart Lane, revives and and re-invents ways to pickle and preserve our produce at peak season...To enjoy the bounty with family and friends throughout the year. Prepared by Chef Bear Cohene of The Cafe - Holiday Inn Country Club Plaza. A perfect surf and turf dinner, this preparation of oysters and KC strip steak merges high quality ingredients with expert preparation technique. Prepared byProprietor Alex Pope of The Local Pig. 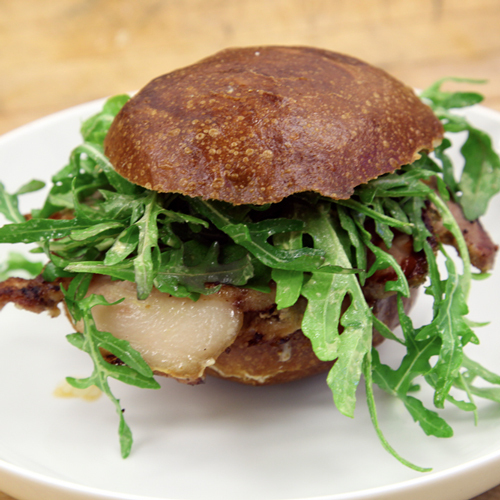 No ordinary sandwich, this delicious porchetta works wonderfully on a pretzel bun for the perfect lunchtime treat. 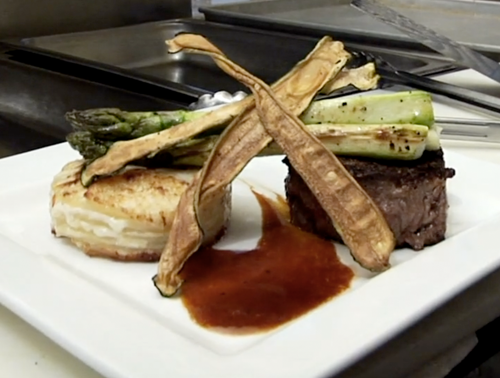 Prepared by Chefs Bob Brassard and Justin Hoffman and students at Broadmoor Bistro. 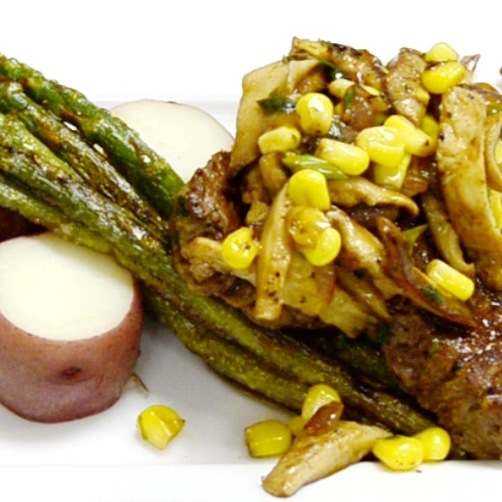 This inventive dish makes use of a non-traditional, yet economically priced cut of meat. 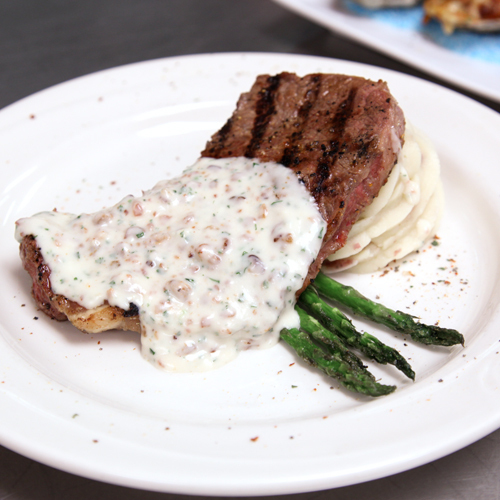 Prepared by Charles d’Ablaing, Executive Chef of Chaz Restaurant & Lounge. American comfort food on a fine dining level. 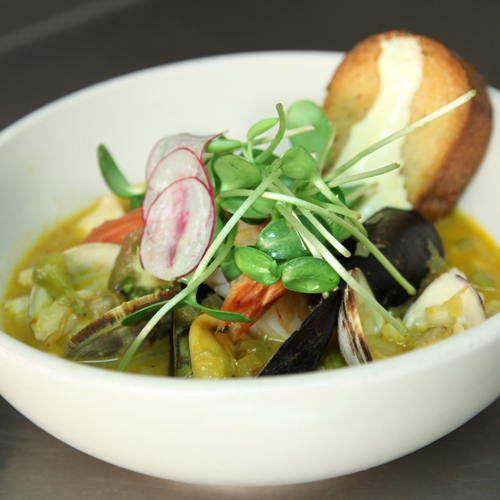 A French classic, this bouillabaisse is a symphony of perfectly balanced flavoring, texture, and color. 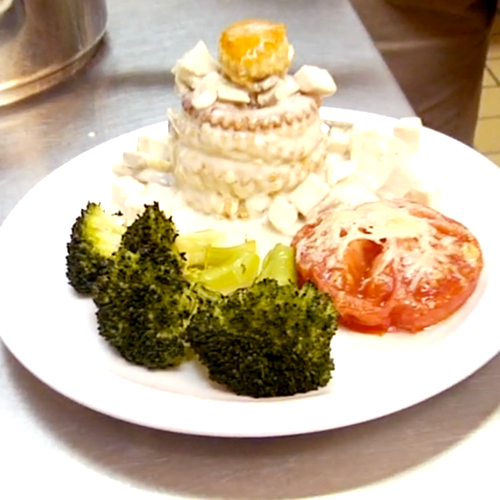 Fresh ingredients make this simple seafood dish an extraordinary treat. Paired with a unique summer cocktail that you'll be eager to recreate at home. 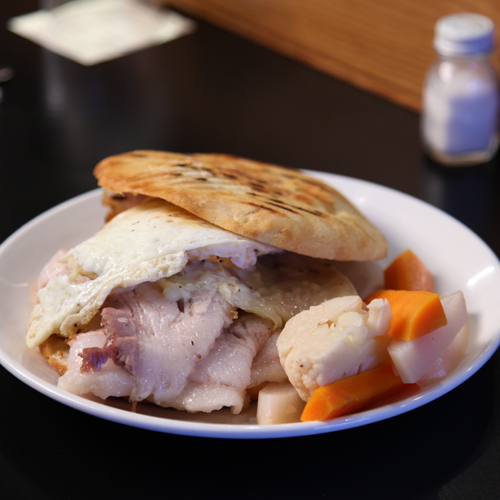 Locally sourced ingredients make this a dish that is flavorful, healthy, and good for the community. Boulevard Pale Ale makes this barbeque tender and delicious. Authentic Swiss flavors have been preserved at Andre’s for three generations by the Bollier family. Ingredients for this signature dish have been imported from Switzerland and include Emmanthal & Gruere cheeses seasoned with Kirsch (Cherry Brandy) and Maggie (Swiss soy sauce). Executive Chef Robert Padilla, Trezo Mare. 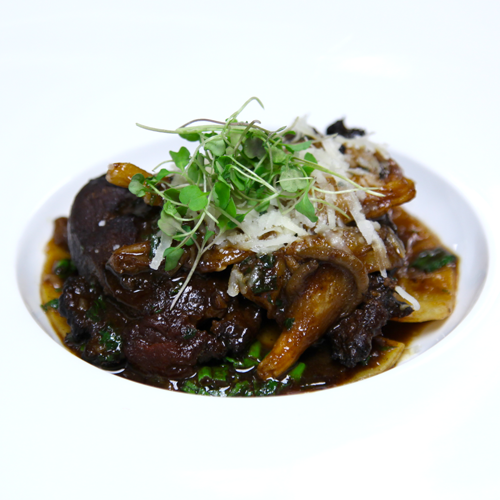 Fresh-made pasta, local organic produce, and grass-fed beef make this pasta dish light, tasty and enjoyable. 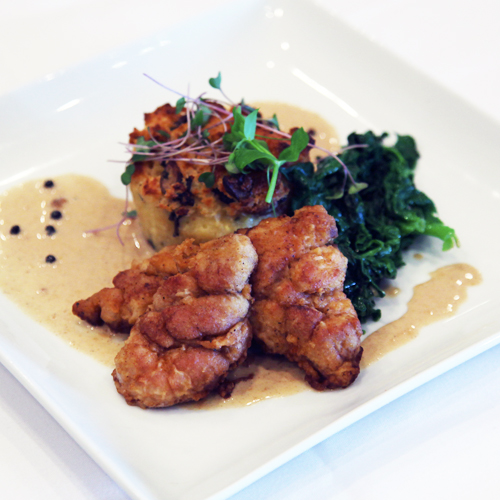 Veal Sweetbreads, Truffle Bread Pudding and Sauteed Spinach with a Cognac Peppercorn Sauce. Prepared by Chef Andy Sloan & Ted Habiger, Executive Chefs of Room 39. A rare treat, this inventive dish is paired with a savory bread pudding that pairs well with these delicious sweetbreads. Prepared by Matthew Arnold, Executive Chef of Webster House. A delictable three-course meal is both inventive and delightful. Prepared by Lon & Stewart Lane, Executive Chefs ofInspired Occasions. Update an an old-world classic. Stuffed Poblano Peppers with Walnut Cream Sauce & Fresh Pomegranate. 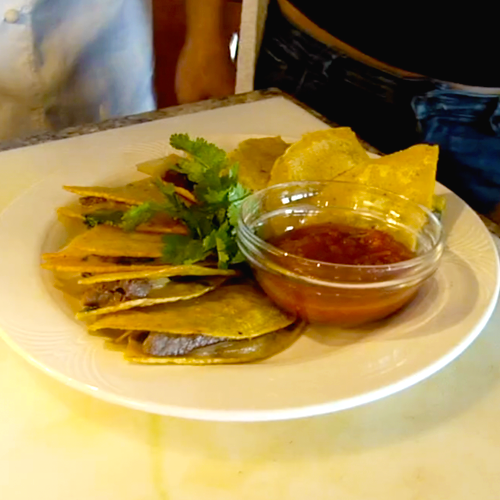 Prepared by Diego Rios Torre, Executive Chef of Frida’s Contemporary Mexican Cuisine. This authentic Mexican dish is a delicious and exotic delight. Prepared traditionally, these peppers are healthy and delicious and bring a little bit of Mexico to the Midwest. 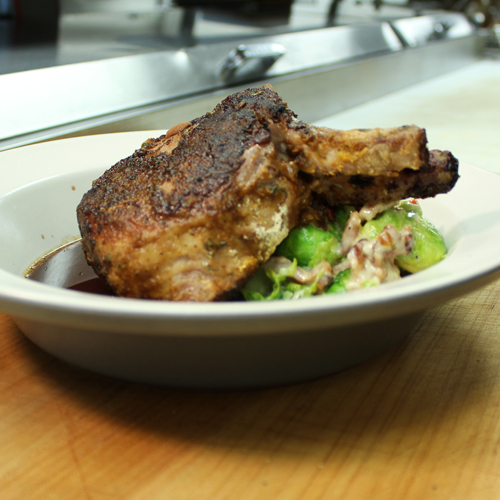 Double Pork Chop, Breaded with Pork Jus & Creamed Bacon Brussel Sprouts. Prepared by Bradley Gilmore, Executive Chef of Gram & Dun. 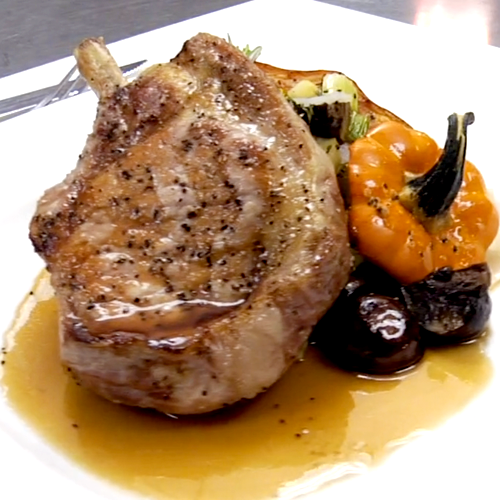 This beautiful pork chop presentation is a crisp and juicy delight. The brussel sprouts are suprisingly delicious with just a touch of cream and bacon. Asian Marinated Salmon with Wasabi Aioli and Spicy Slaw on a Sesame Bun. 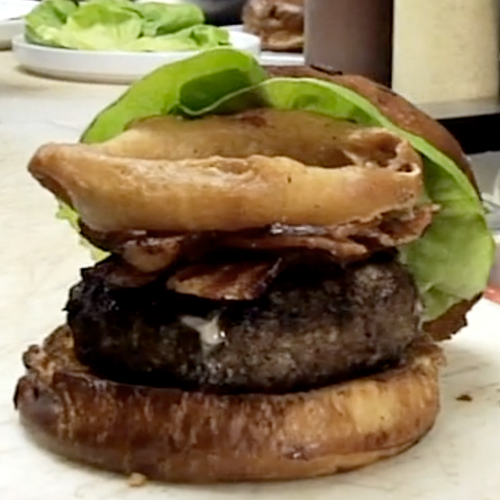 Prepared by Jayson Eggers, Executive Chef of Blanc Burgers + Bottles. 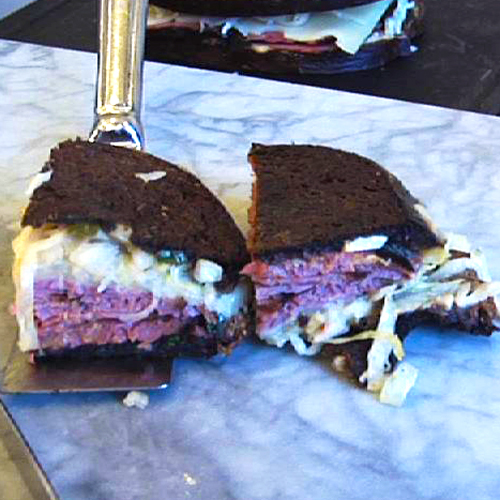 This delicious recipie makes a seemingly simple sandwich into a delicious, exotic fine dining treasure. Prepared by Bonnie's Mom, Ida Mour. This traditional dish is both delicious and easy to prepare. In addition to the potato latkes, we offer holiday favorites in the form of Tyler Florence's Whipped Sweet Potatos, and Mark Grove's Peanut Brittle. 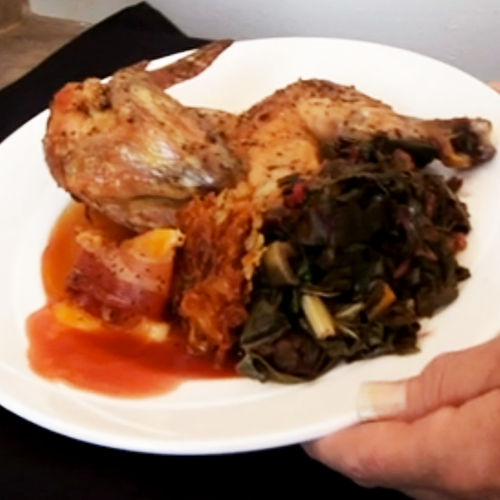 Prepared by Dwight Hawkins, Executive Chef of Rozzelle Court-Nelson-Atkins Museum. 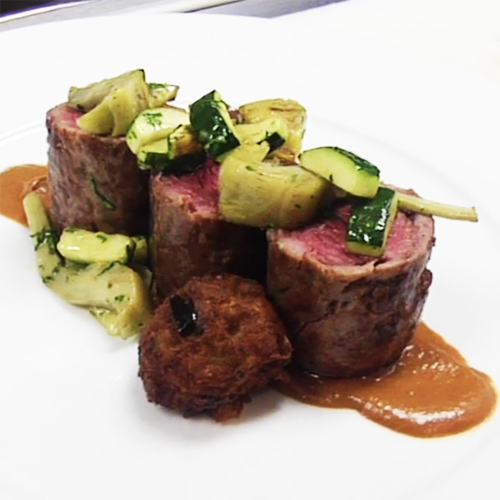 These two preparations of lamb are juxtaposed to create a balance of smokiness, thanginess, and sweetness. 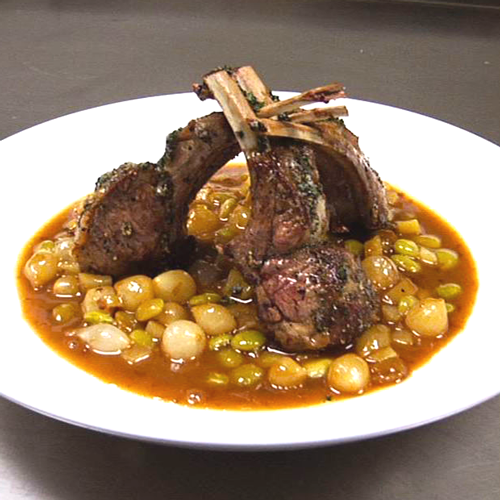 This fall-off-the bone lamb dish is the perfect mid-winter meal. 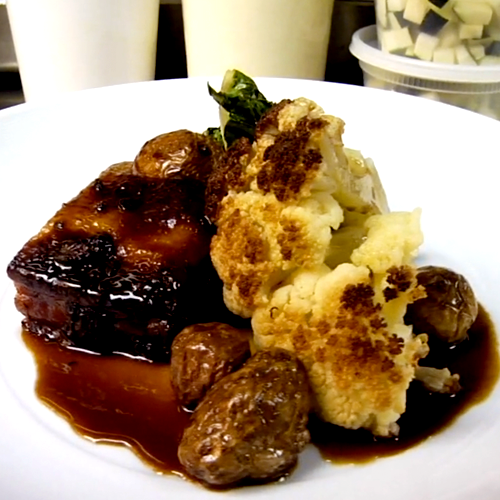 Prepared by Carl Thorne-Thomsen, Executive Chef of Story. 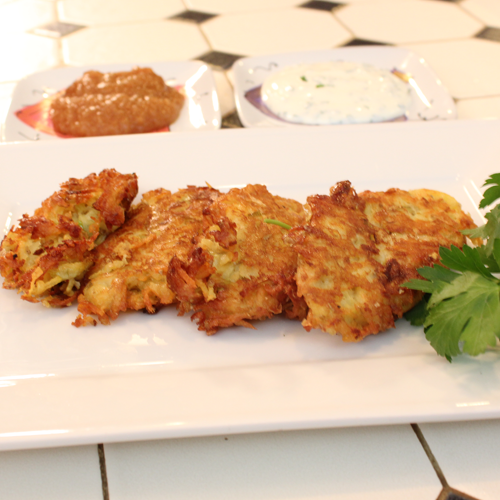 Light yet flavorful falafel accompany an amazing preparation of lamb "crepinette." Artichoke, zucchini, and roasted mole add depth of flavor to this dish. Prepared by Randy Parks, Executive Chef of You Say Tomato. This delicious fried chicken is moist on the inside and crisp on the outside. Served with delicious fresh and locally raiseed vegtables, this meal is both mouthwatering and ethical. Bruschetta of Seared Ahi Tuna and an Edamame-Wasabi Puree. Prepared by Amy Presson, Executive Chef of Marina Grog & Galley. A perfectly balanced mixture of edamame and wasabi complement this beautifully prepared tuna. There is no substitute for fresh, flavorful tuna so be careful to purchase only the best when attempting to replicate this at home. Prepared by Debbie Gold, Executive Chef of The American Restaurant. 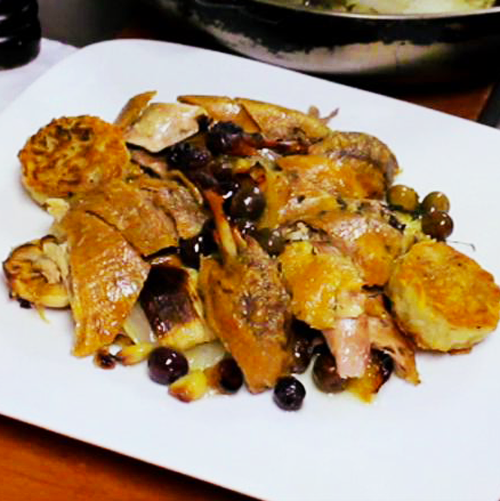 Duck confit is a crisp, delicious dish that is worth the effort that it takes to prepare it. Consider it as a special treat for a holiday meal. Prepared by Ken Baker, Chef of Pachamama. 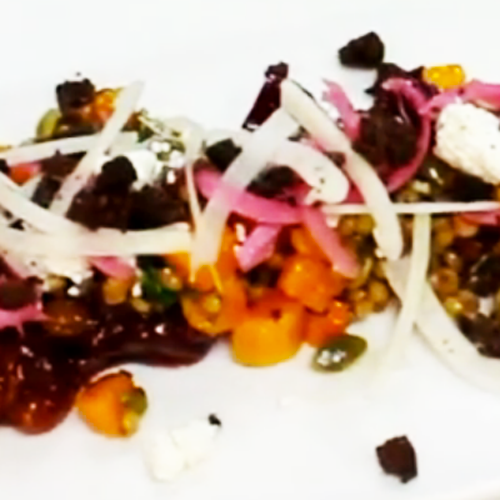 Autumn Salad of Wheat Berries, Chevre, & Dark Rye Crumble. This recipe is the perfect way to start the fall season. It is sure to delight as you taste sweet, tart, and salty flavors; feel the delightful textures of the wheat berries and chutney; and enjoy the beautiful colors of this amazing autumn salad. 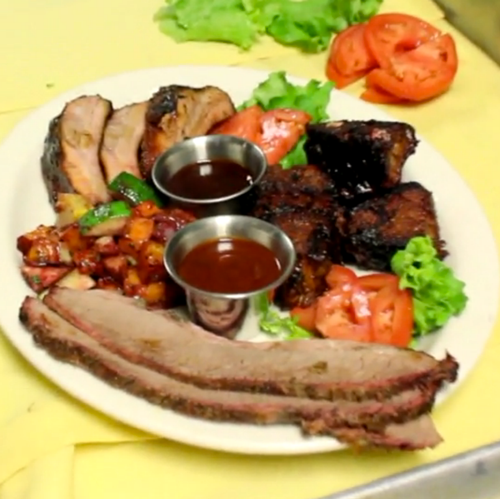 Prepared by Thomas Belislie and Chris Marks , Chefs of The Café at Briarcliff Village. Smoked Pork Ribs, Brisket and Burnt Ends with Sweet Potato Fries and a Roasted Medley of Autumn Vegetable. 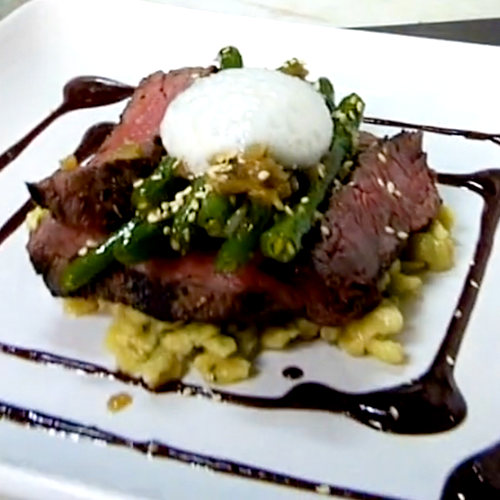 Another great recipe with two of Kansas City's premiere chefs. Prepared by Tim Johnson, Executive Chef of Johnson County Community College Dining Services (Nerman Museum). A fresh, and environmentally responsible meal using food from local growers. This menu is from their 4th Annual Sustainability Expo & Dinner This week features one of our "In the Cellar" special with Marquee Selections. Prepared by Michael Beard, Executive Chef of 715. Freshly butchered pork rubbed with a complex mixture of seasonings that is then slow roasted creates a spectacular porchetta Panini. Prepared by Tim Johnson, Executive Chef of Johnson County Community College Dining Services (Nerman Museum). Fresh, wholesome salads takes full advantage of the summer harvest. This week features the premiere of our "In the Cellar" special with Marquee Selections. 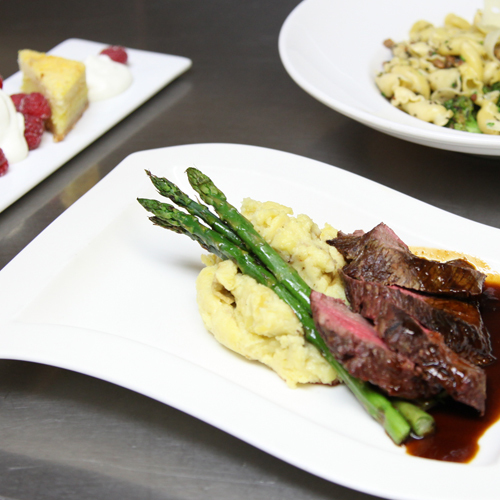 Prepared by Charles d’Ablaing, Executive Chef of Chaz Restaurant & Lounge. 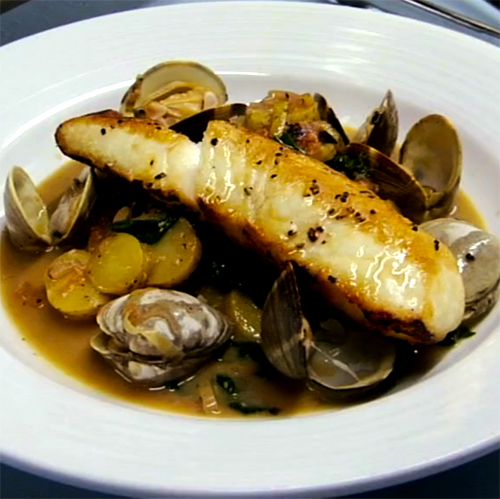 Fresh ingredients make this simple seafood dish an extraordinary treat. Prepared by Tim Johnson, Executive Chef of Johnson County Community College Dining Services (Nerman Museum). A fresh, wholesome soup takes full advantage of freshly picked summer produce. Crisp vegtables provide flavor and mouthfeel. Finally, as a special treat, this week's recipe includes a delicious blackberry lemondae. Prepared by Jesus Almos, Executive Chef of Piropos Restuarant. 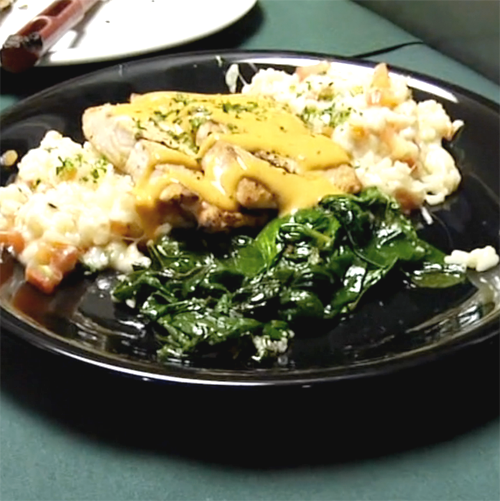 Local foodies are fortunate to get a taste of this Argentinian-inspired dish. 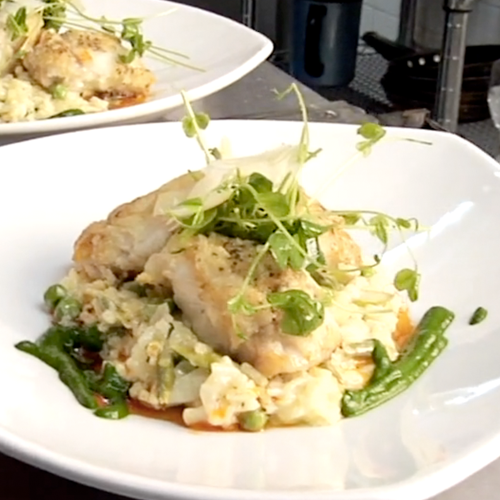 This halibut preperation is the perfect combination of flavorful and inventive. 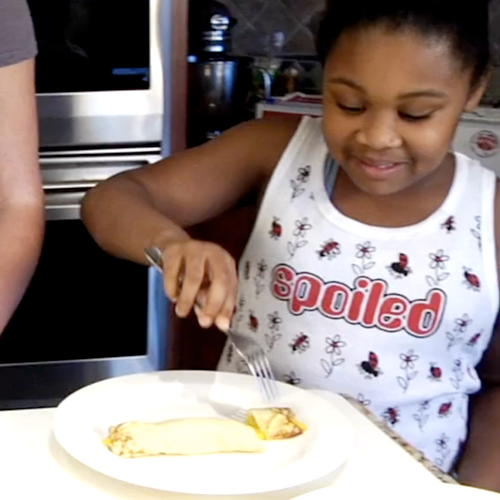 Cooking with Kids: What to Have for Dinner? 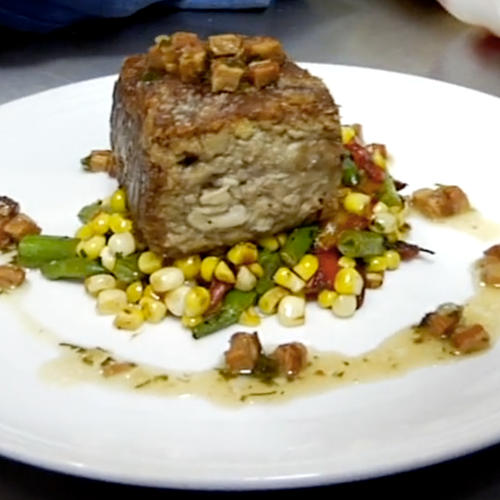 Sponsored by Children’s Mercy Hospital and Clinics & Whole Foods Market Prepared by Executive Chef Travis Napier These easy to prepare dinner recipes are both healthy and kid-friendly. So fun and easy to make, your kids will love helping out. Executive Chef Robert Padilla, Trezo Mare. An exquisite take on duck breast, a chocolate-cherry sauce makes for an inviting, decadent meal that can be enjoyed year round. Proprietor Becky Glaze, Cockrell Mercantile Company. 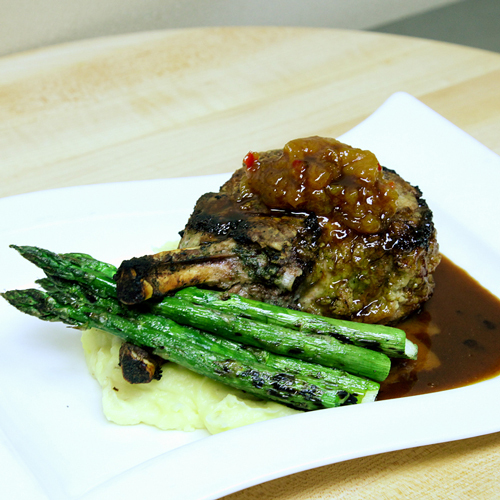 Prepared by Thomas Belisle, Executive Chef of The Café at Briarcliff Village. Prepared by Tim Johnson, Executive Chef of Johnson County Community College Dining Services (Nerman Museum). 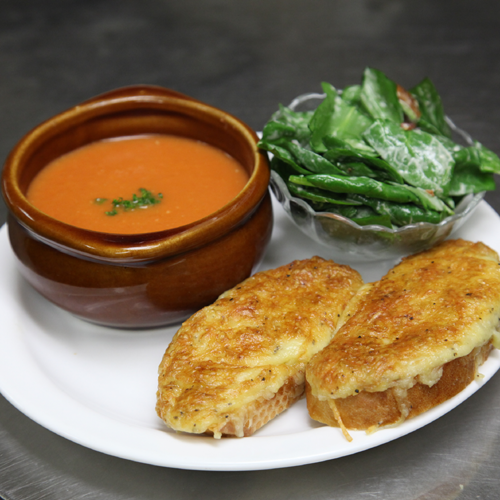 Classic comfort food is recreated as an exquisite dining experience. This favorite takes moves from the family dinner table to an upscale setting that's perfect to celebrate St. Patrick's Day or to indulge for an everyday treat. 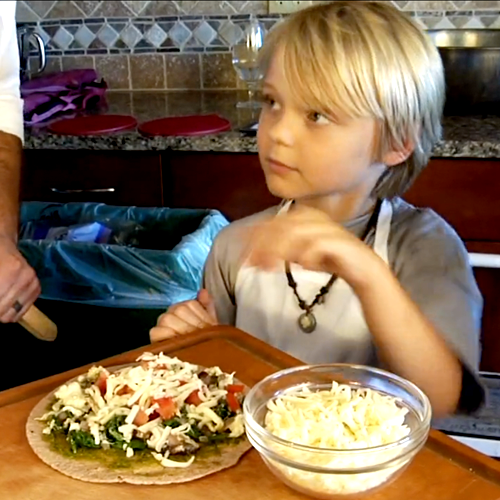 Sponsored by Children’s Mercy Hospital and Clinics & Whole Foods Market Prepared by Executive Chef Charles d’Ablaing These easy to prepare snack recipes are both healthy and kid-friendly. So fun and easy to make, your kids will love helping out. Prepared by Rene Bollier, Executive Chef of Andre’s Confiserie Suisse. The attractive presentation that this dish makes is just the beginning. A light, upscale chicken pot pie, this dish will please both the fastidious foodie and the fussy family. Complementing this dish is one of Andre's most innovative post-meal pleasures: the Caramel Pot de Crème. 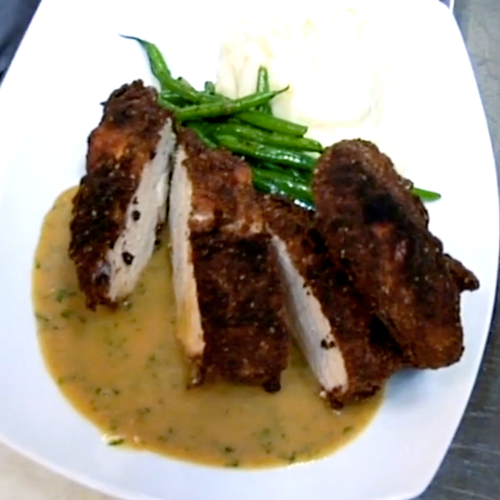 Campo Lindo Fried Chicken with Mashed Potatoes, Haricot Verts and "Starker’s Gravy"
Prepared by John McClure, Executive Chef of Starker's Restaurant. This organic, locally raised chicken is transformed into a moist, flavorful dish. Starker's chicken surpasses any expectations for fried chicken. Prepared by Stephanie Dumler, Executive Chef of The Westside Local. A flavorful treat, this quinoa dish has deep, rich flavors with being too complex. 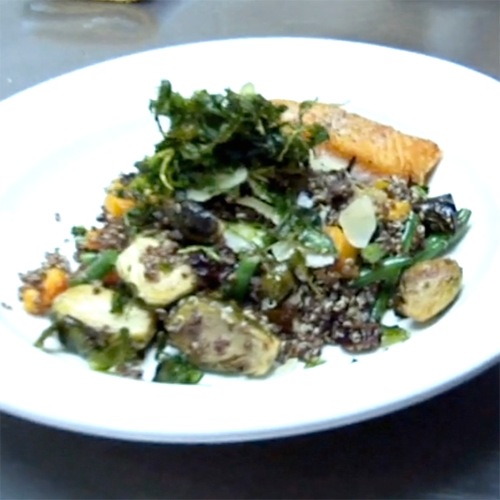 This dish can be served without the salmon as a vegitarian dish. You'll hardly believe that this exquisite dish is so healthy! 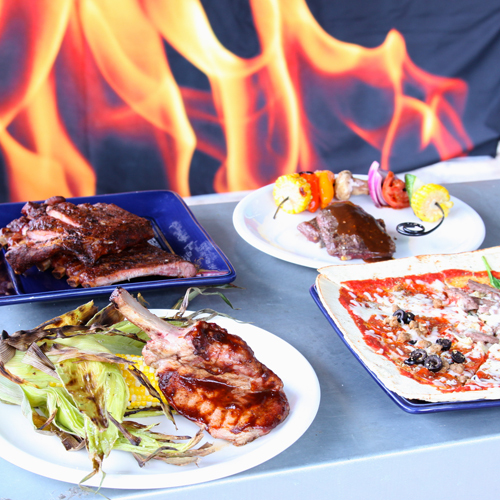 Prepared by Eddie Djilali, Executive Chef of Gaslight Grill. Delicious lamb recipe. 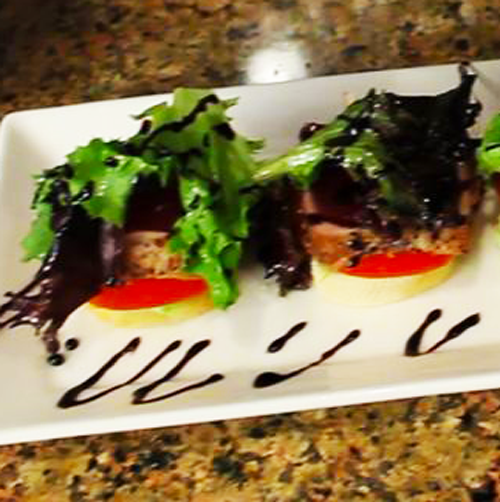 Prepared by Daniel White, Executive Chef of Trezo Vino Wine Bistro.  Freshly prepared pasta paired with a light, creamy sauce is balanced by the delightful crunch of a fried pasta garnish. This dish is perfect for sharing, but you just may not want to! Prepared by Tim Johnson, Executive Chef of Johnson County Community College Dining Services (Nerman Museum). Quality ingredients makes this dish a work of art. 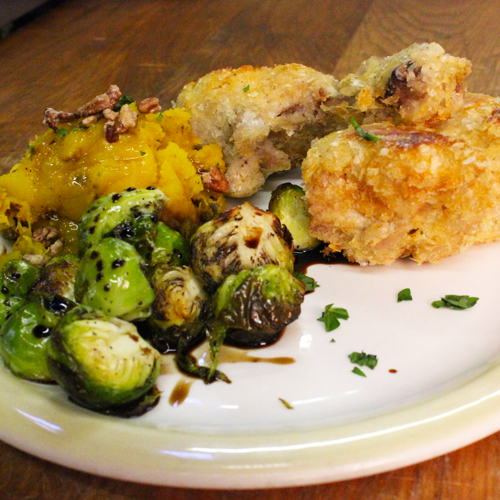 A beautiful symphony of color, flavor, and texture, this dish is a perfect dish for winter. 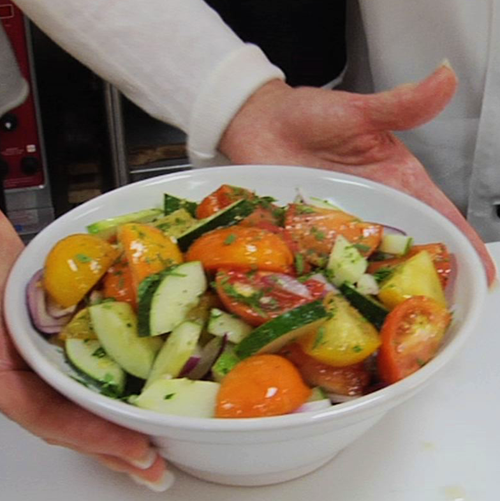 Sponsored by Children’s Mercy Hospital and Clinics & Whole Foods Market Prepared by Executive Chef Michael Woods Three easy to prepare lunch recipes that are both healthy and kid-friendly. So fun and easy to make, your kids will love helping out. Prepared by Dawn Siddall, Executive Chef of Chez Elle Craperie. 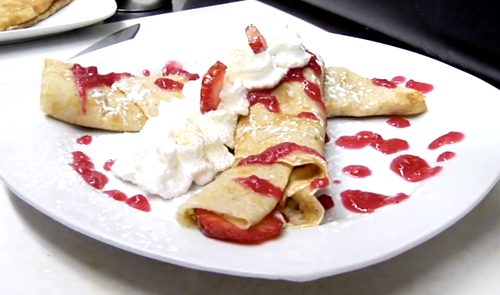 These crepes can be the perfect start to the day. 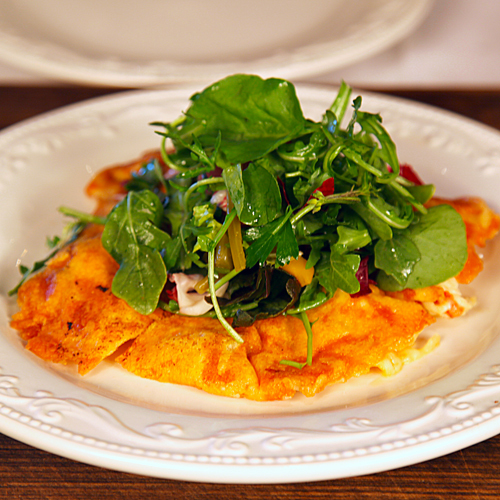 Fresh ingredients make this light dish not only absolutely delicious but healthy and enjoyable. Prepared by Executive Chef Travis Napier of Bristol Seafood Grill. 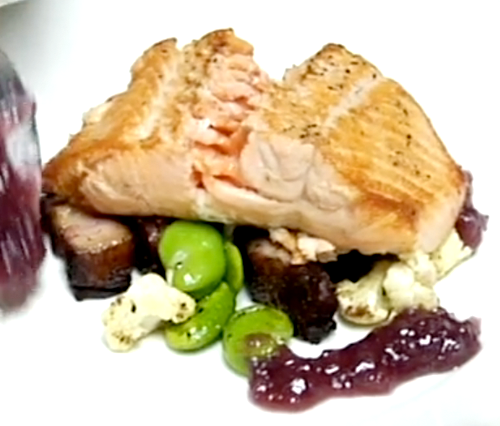 Buttery, melt in your mouth salmon is juxtaposed with a unique vegtable bed of cauliflower and fava beans set off by a delightful hint of bacon and onion. 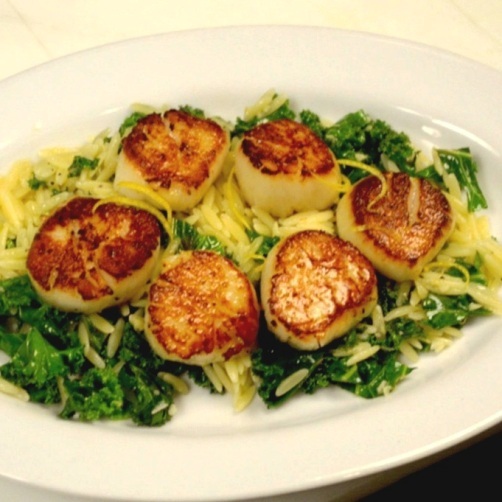 Prepared by Executive Chef Dan Swinney of Lidia’s This heavenly pasta makes use of fresh, local ingredients. This plate offers three distinct tastes, presents the finest that Italien cuisine has to offer, and culminates in an amazing culinary experience. 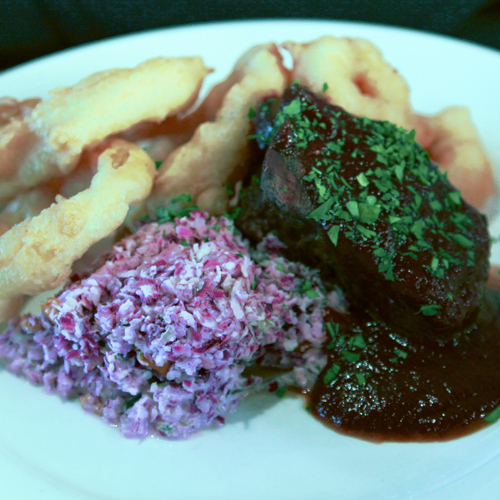 Majinola American Kobe Rib Eye with wild mulberry maple red wine sauce, herbed spaetzle, green bean, shallots, sesame seeds and pine froth. 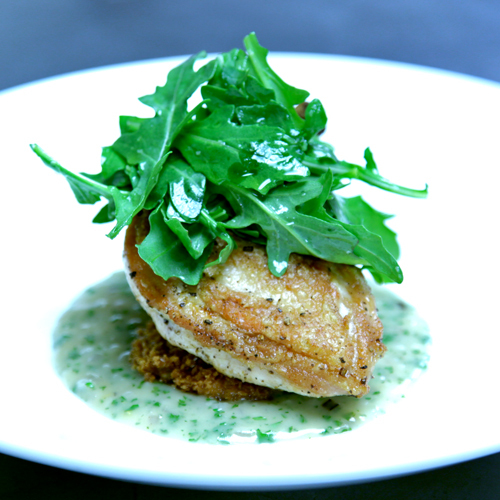 Prepared by Jonathan Justus, Executive Chef & Owner of Justus Drugstore Restaurant. The pinnacle of fine dining in Kansas City, this exquisite preparation of Kobe beef is perfectly seasoned and the pine needle froth is at the cutting edge of the culinary arts. Ingredients make the local produce into a masterpiece. 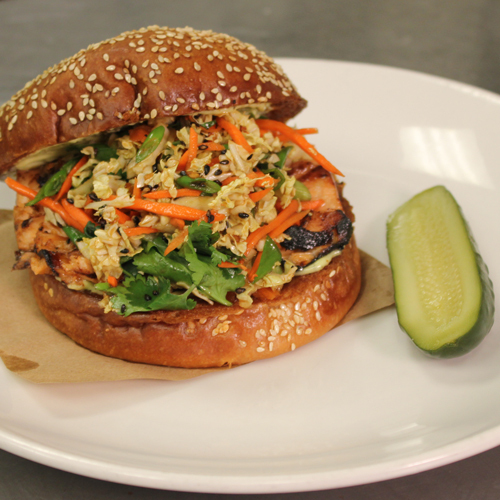 Prepared by Lindsey Hintz, Chef and Alan Gaylin, Restaurateur - BRGR Kitchen + Bar. Two fabulous hamburger recipes turn the classic American favorite into an exquisite dining experience. Sponsored by Children’s Mercy Hospital and Clinics & Whole Foods Market Prepared by Executive Chefs Martin Woods (Yia Yia’s) & Josh Eans (Blanc Burger + Bottles) Four easy to prepare breakfast recipes that are both healthy and kid-friendly. So fun and easy to make, your kids will love helping out. Prepared by Debbie Gold, Executive Chef of The American Restaurant. 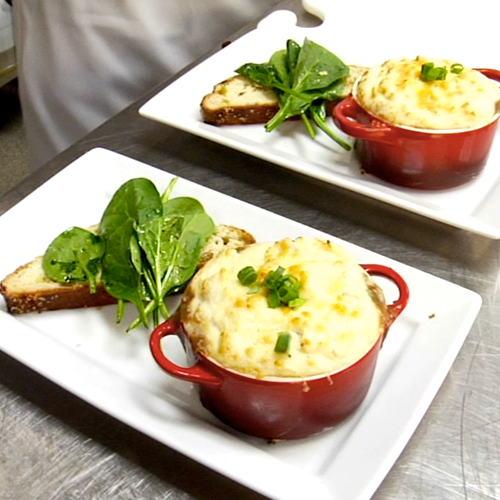 American comfort food at its finest, this dish is perfect for the fall season. 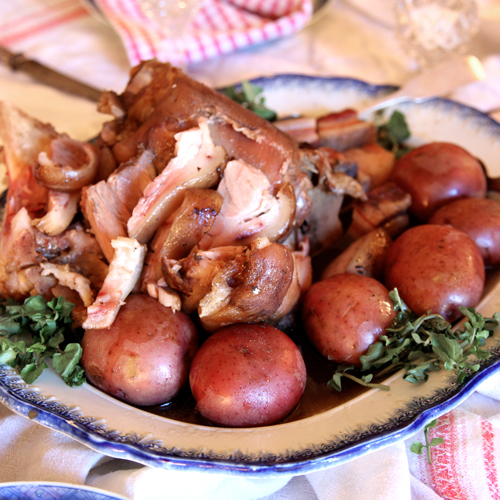 This recipe turns ordinary pork into a mouthwatering, savory experience. 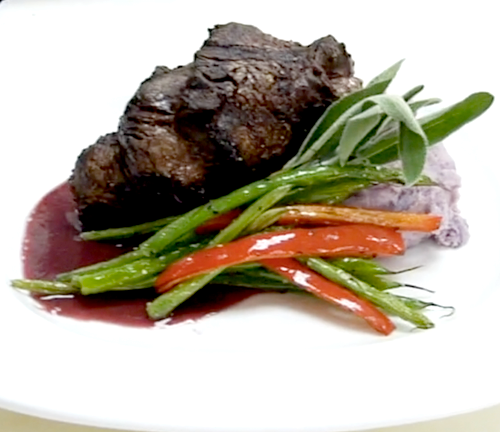 Prepared by Dwight Hawkins, Executive Chef of Rozzelle Court-Nelson-Atkins Museum. 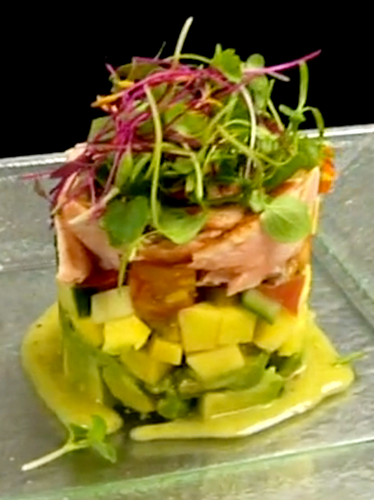 Fresh produce complement the rich taste of salmon in this light, enjoyable salad. 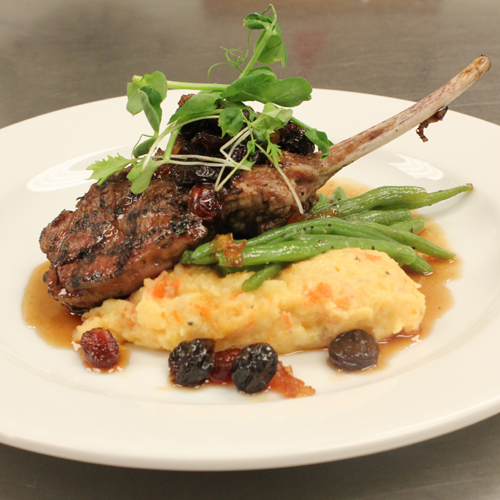 Prepared by Tim Johnson, Executive Chef of Johnson County Community College Dining Services (Nerman Museum). This recipe transforms the traditional pork chop into a dish that is colorful, flavorful, and juicy. Prepared by Tatsu, Executive Chef of Tatsu’s. 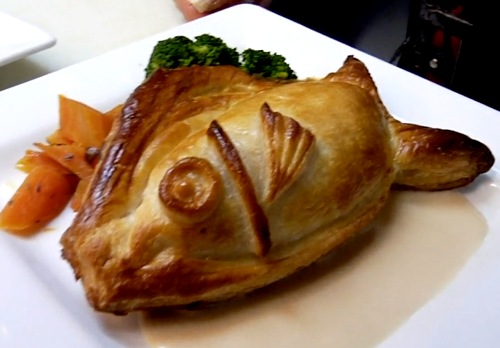 Fresh salmon, buttery puff pastry, and a delectable sauce come together to create this exquisite example of French Cuisine. This seafood dish is deliciously rich, and yet suprisingly delicate. 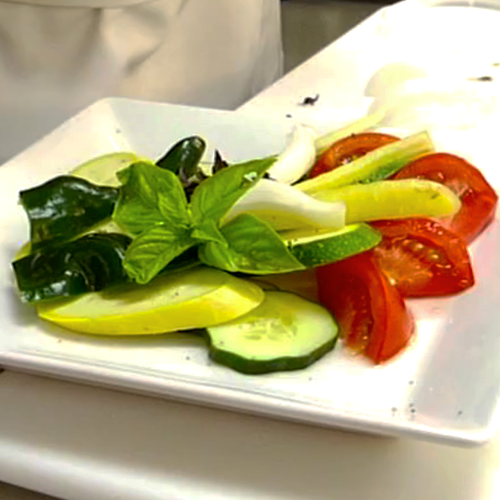 Prepared by Randy Parks & Mark Wingard, Executive Chefs of You Say Tomato. A traditional German dish, the bierock is a scrumptious example of comfort food. This simple cultural fare is perfect for any season, no matter one's age or background. Prepared by Martin Woods, Executive Chef of Yia Yia’s. Putting to use some farmer's market favorites, this seasonal recipe is perfect for those balmy summer days. Local produce makes this recipe good for you, the environment, and the tastebuds. 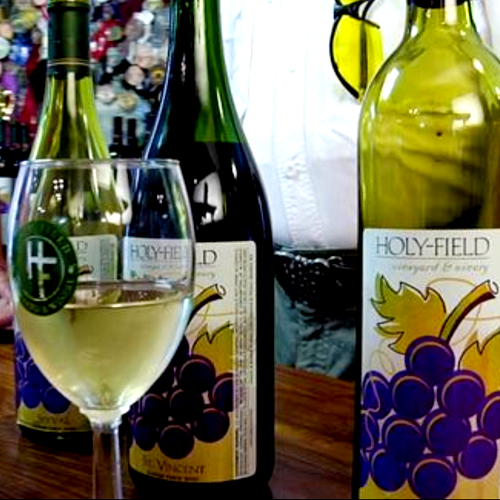 Presented by Les & Michelle Meyer, Vintners of Holy-Field Vineyard & Winery. What foodie doesn't love a quality wine? This show explores the creation and background of one of the Midwest's finest wineries. Prepared by Michael Smith, Executive Chef of Michael Smith & Extra Virgin. 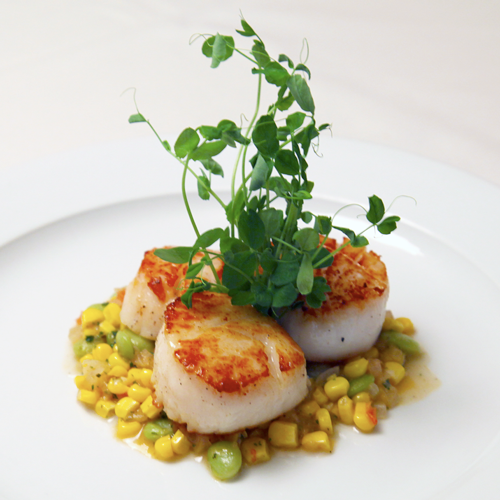 This exquisite recipe plays with contrasting textures and complex flavor to create a memorable dining experience. 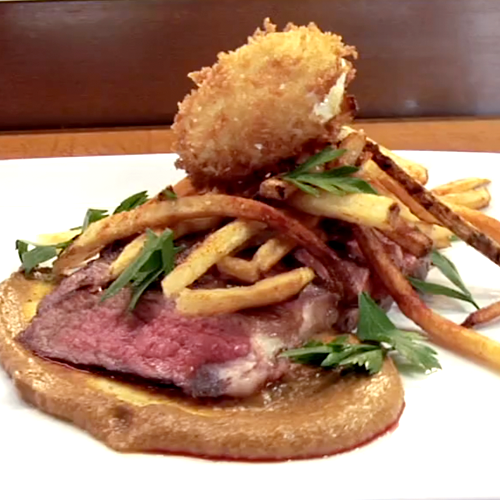 A fusion of comfort food and upscale fine dining, this dish is unlike anything commonly found in the Midwest. Prepared by Celina Tio, Executive Chef of Julian. A perfect summer recipe, this dish balances the sweet seasonal corn with the smokiness of the bacon. The beautiful colors delight the eyes before even taking a taste. Grilled Heritage Pork Chop with Zucchini Pappardelle and Hominy. Prepared by Chef Andy Sloan & Ted Habiger, Executive Chefs of Room 39. This creative summer dish is light and tasty and makes the best out of local, sustainable produce. This recipe offers even the most traveled foodie something flavorful and new. Inside Out burger, Truffle Fries, Paired with an Artisanal Beer. 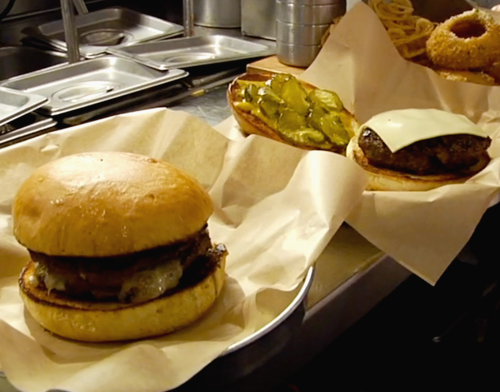 Prepared by Josh Eans, Executive Chef of Blanc Burgers + Bottles. 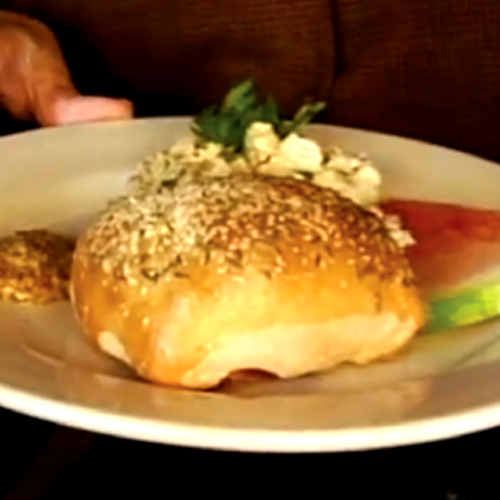 This exquisite hamburger recipie makes the conventional hamburger into a fine dining treasure. Pan Seared Monk Fish Medallions on a Bed of Saffron Risotto with Sauteed Spring Vegetables, Garnished with Pea Shoot Salad & Infused Oil. Prepared by Leon Bahlmann, Executive Chef of Café Trio. A light, tasty seafood recipe perfect for the heat of summer. 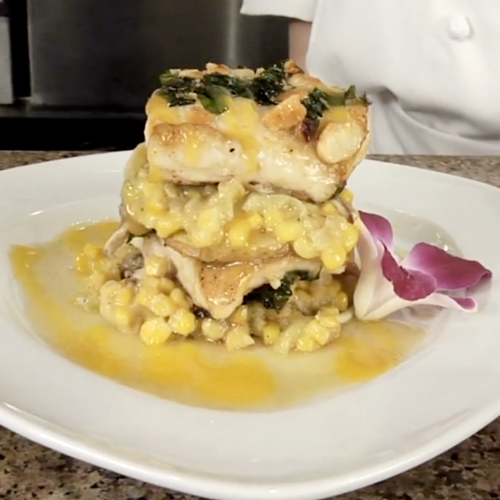 This dish makes a beautiful presentation from a less-than-attractive fish and pairs it with an amazing saffron risotto. Pan Seared Hawaiian Snappers, Layered with Yukon Gold Potato Tiles, Topped with Mango Puree and Shiitake Mushrooms. Prepared by Amy Presson, Executive Chef of Marina Grog & Galley. This beautiful dish is an artful combination of texture, flavor, and color. This seafood will impress and delight even the most discriminating tastes. Prepared by Charles d'Ablaing, Executive Chef of The Webster House. This magnificent potato recipie pairs beautifully with the mosit, buttery prime rib. Prepared by Chef Tim Johnson of Cafe Tempo. Stuffed Tempura Squash Blossoms are a light, flavorful, and satisfying. This dish serves well as an upscale appretizer, or even a light mid-day meal. 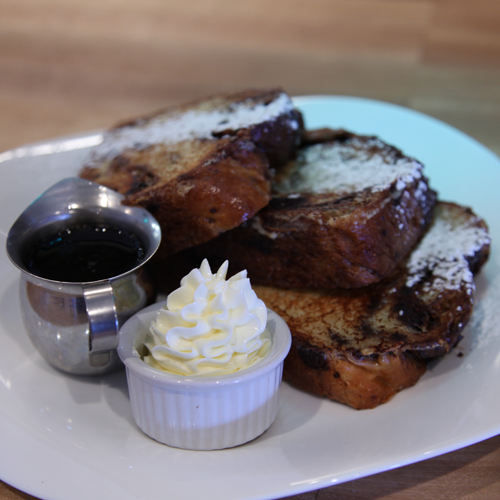 Prepared by Michael Turner, Executive Chef of The Classic Cup Café. 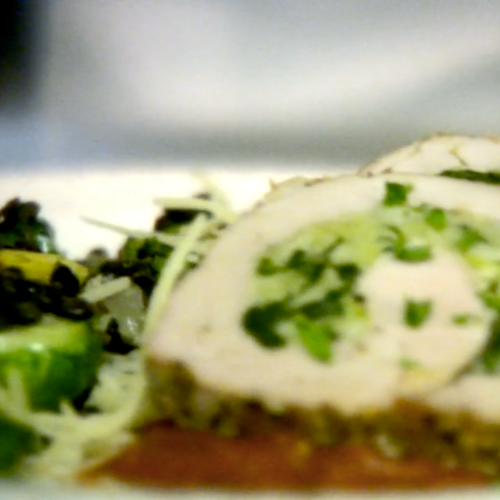 The Pork Tenderloin Roulade represents some of the best in fine dining, this recipe creates a stunning, delightful presentation using bright vegtables and pork tenderloin.